A few days ago Intel released their QLC bearing SSD 660p bearing some interesting tech. While these drives are solidly aimed at the lower end of the market, SemiAccurate thinks there is a lot more to see here than you might expect. It is hard to get excited about a new mid/low end SSD release but Intel did put two things into the new SSD 660p that alter that perception. Those two things are of course the QLC (Quad-Level Cell or 4-bit per cell) flash and a dynamic SLC (Single Level Cell or 1-bit per cell) cache mode. Better yet the price also craters with the 512GB drive costing $99 and the 1TB comes in at $199 MSRP. There is a 2TB version but no price on that one yet. If you look at the above chart you can see that the raw numbers fall between the 5-series and 6-series in most ways. One notable change is that the 660p does not support SATA. While the M.2 form factor is a technical mess, the sooner SATA dies the better the world will be. The PCie3 x4 interface supports up to 1800MBps for sequential R/W and 220MBps for random R/W speeds all supported by the dynamic SLC cache. This dynamic cache is really interesting tech and how it plays out in the real world will be something to watch over the next few months. While we didn’t get a sample to play with, you can see a lot of the numbers at Anandtech. Officially Intel claims that the speeds of the drive will appear to be at SLC levels until the drive is ~75% full when they will drop to effectively QLC speeds. The Anandtech numbers show that when the drives are full, write speeds drop to 1/4 of SLC speeds or less, benchmark dependent. The official Intel numbers for sequential vs random writes show a nearly 88% performance drop. Update Aug 9, 2018 @3:23pm: Legit Reviews has a good article here where you can see the performance and the changes when you overrun the cache. That is the price you pay for not having a dedicated cache, but you also don’t pay the price of a dedicated SLC or more likely DRAM chip. Is it worth a few dollars more for the extra speed when the drive is full? That is your call and there are plenty of drives that offer large, fast caches on the market, and plenty of drives that offer nothing and are quite a bit slower than the 660p. That said lets take a look at how the caches work. The dynamic caches work by putting the QLC flash into SLC mode which means faster reads and writes for the price of using 4x the capacity. If the data is handled correctly, it will be copied transparently into QLC regions during idle periods and the user will never notice. If it is done incorrectly it will either overrun and the user will see QLC speeds or it will pause the drive to copy at which time the user will see the device effectively lock. Most users won’t ever see either case but power users should at least be aware of how the cache works before buying. As you can see above the dynamic cache allocates SLC regions based on how full the drive is. It varies from 14-15% of the drive space as SLC, or ~60% of the drive’s total capacity, to ~1.2% of the drive’s rated capacity when the SSD is >75% full. If you look at the 512GB 660p, at 235GB used the SLC cache takes up 55GB or 220GB worth of QLC space. 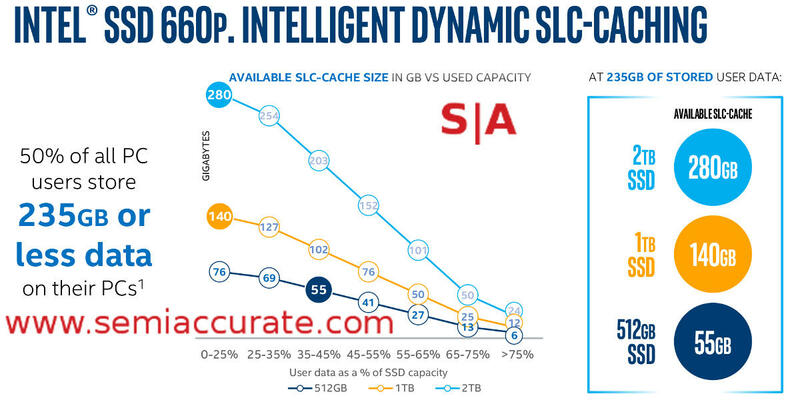 If there is no SLC cache there would be 277GB of space on that drive so Intel is effectively mapping out a 1:1 SLC to free QLC area which makes a lot of sense for housekeeping, plus a little slack space. The 1TB and 2TB versions use roughly the same ratio so don’t expect them to behave differently, just have higher tolerances for overrunning the cache. Again this isn’t a good or bad thing, it just is, and now you know how to figure out the tradeoffs. Moving on to the QLC cells the story is a lot less pretty here, and that is all because of one number, TBW. TBW or TB Written is effectively the endurance of the drive. This is how many time a cell can be written before it dies, modified by overprovisioning. Enterprise drives have lots of overprovisioning, use higher bin flash chips, and generally are rated more conservatively than consumer drives. You do get what you pay for. Intel didn’t say how much overprovisioning the 660p has, but based on the sizes it is pretty small. Overprovisioned drives tend to show their lifetimes in gross sizes, a 480GB drive will probably have 32GB spare capacity vs a 512GB drive. Like the 500 and 700 series SSDs, the 660p has little overprovisioned capacity, about par for the course in mid-range consumer drives. The problem lies in the TBW number, it is significantly lower than the other series, enough so that it is a problem. 660p drives are rated at 100 TBW per 512GB of space versus 288 TBW per 512GB on the 500 and 700 series. Before you pull out the calculator it rounds to 35% of the writes of a TLC drive, and those weren’t exactly spectacular in their endurance. Why does this concern us? Most people don’t understand that SSDs are wear items, unlike most other storage or memory, they die after a finite period of use. Dropping an already low write endurance by that much worries us. Most consumers won’t come close to that number but a power user unknowingly picking one of these drives up could have issues. Once again this isn’t to say don’t buy a 660p, SemiAccurate is just saying that you should understand what you are doing and act accordingly. If 100TBW is sufficient for your workloads, great, the 660p is quite inexpensive.